Currently predicts 107" TTT at maturity!! 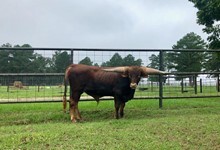 Brindle bull with great horn set. Cowboy Catchit Chex on top and Jimmy Jones breeding on bottom! Owned by North Texas Connection partnership. GREAT producer with low twist horn. 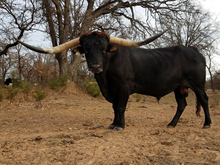 He produces some nice calves with color and horn.